The Sabi Sand Pfunanani Trust aims to facilitate community engagement on conservation issues, increasing their involvement in wildlife, and encouraging youth participation in conservation. We believe that the well-being of the communities neighbouring the reserve is integral to the wildlife of the area. Not only do we promote an interest in the environment, but we also provide education on natural resources and land management. We believe you can improve livelihoods through improving land use. The Trust’s role is to offer guidance on sustainable management while preserving traditional agriculture and indigenous knowledge systems. By educating community members about the environment and helping them to access conservation areas, we foster a collective appreciation for our beautiful surroundings and encourage participation in the stewardship of it. 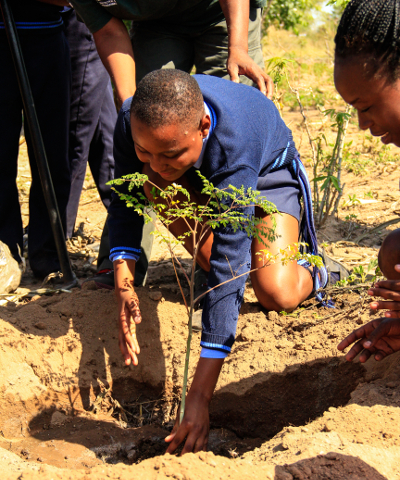 One example is a recent event where approximately 100 community members – including high school children, members of different community groups, headmen and elders – were hosted at Sabi Sand lodges and had the opportunity to witness, up close, the rhinos and the reserve. The communities we are engaging with are at the forefront of the rhino-poaching crisis, and to them it poses the loss not only of such an iconic species, but of their own national heritage. Poaching is a threat to the future of wildlife as a whole, and introduces dangerous criminal elements into local communities. This issue is one of the Trust’s primary target areas of work, and it is the reason we have recently introduced the Community Environmental and Rhino Ambassador Programme.